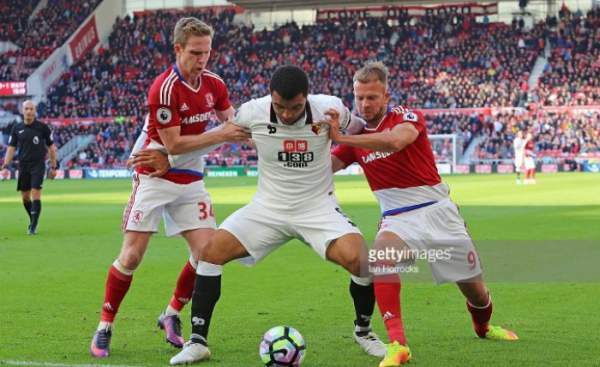 Watford vs Middlesbrough Live Streaming: Today we have the 21st matchday of the Premier League, and it is Watford hosting Middlesbrough at the Vicarage Road for their game. Watford is 14th on the table with 22 points from 20 games, below on goal difference from West Ham United and one point above Leicester City. On the other hand, we have Middlesbrough who has 19 points from 20 matches, two points below Leicester City and three points above Crystal Palace. Watford played against Burton Albion in the third round of the FA Cup and won the game by 2-0 with ease. Kabasele and Jerome Sinclair scored for the home team. They are going through a rough patch in the Premier League as they haven’t won any game in their last five, losing four and drawing one. Troy Deeney has scored in six of his last eight league games against Middlesbrough. They haven’t lost any of their last six games against Middlesbrough, losing in October 2012. They played against Stoke City in their last game of the premier league and lost the game by 2-0 with Shawcross and Crouch being the scorer. Middlesbrough has lost five of their last seven league visits to Watford, winning just one. They have won just four games out of the 20 games, scoring 17 goals and conceding 22 goals. They played in the FA Cup Third round and won the game by 3-0 at home with ease against Sheffield Wednesday with Leadbitter, Negredo and de Roon among the scorers. They have won one of their last six league games, losing four. As they beat Sheffield Wednesday in the FA Cup, they are currently aiming at back to back wins for the first time since April 2016. (4-5-1 formation): Gomes, Prodl, Kaboul, Britos, Holebas, Kabasele, Guedioura, Behrami, Capoue, Deeney, Doucoure. (4-3-3 formation): Guzan, Gibson, Fabio, Chambers, Barragan, Forshaw, de Roon, Clayton, Traore, Negredo, Ramirez. Both teams are aiming for three points and will try their best to win it.